"Hassan I" redirects here. For the Maldivian sultan, see Hassan I of the Maldives. Hassan I of Morocco (Arabic: الحسن الأول‎‎) (1836 – 7 June 1894) was Sultan of Morocco from 1873 to 1894. He was the son of prince Abbas and succeeded to his uncle Mohammed IV. He was a member of the Alaouite dynasty. Moulay Hassan was among the most successful sultans. He increased the power of the makhzen in Morocco and at a time when so much of the rest of Africa was falling under foreign control, he brought in military and administrative reforms to strengthen the regime within its own territory, and he carried out an active military and diplomatic program on the periphery. Nephew of the sultan Mohammed IV, Moulay Hassan was proclaimed sultan of Morocco on the death of his uncle in 1873. His first action was to crush an urban revolt in the capital Fes. The new sultan was committed to continue the modernization and reform policy of his father. Particularly well known is the journey Hassan I undertook in 1893. He went from Fez (leaving on 29 June) to Marrakech, passing through the Tafilalt, the sand dunes of Erg Chebbi, the valley of the Dades with the majestic gorges of the Todra, Ouarzazate, the Kasbah of Aït Benhaddou, the high passage along Telouet, the Tichka pass (2260 m) in the high Atlas, Guelmim port of the Western sahara. The voyage took six months and succeeded in its objective of reuniting and pacifying the tribes of several regions. The Krupp cannon he gave on this occasion to the caid of Telouet (member of the now famous Glaoua family) is still on display in the center of Ouarzazate. In 1881 he founded Tiznit. Hassan I appointed Mouha ou Hammou Zayani as Caïd of the Zayanes in Khénifra in 1877. Mouha ou Hammou Zayani was to be an important figure in the 20th century colonial war against France. 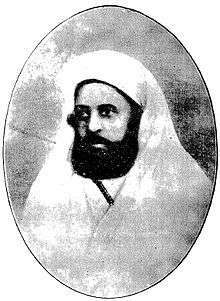 In 1887 he appointed sheikh Ma al-'Aynayn as his caid in Western Sahara. Ma al-'Aynayn too played an important role in the struggle for independence of Morocco. Moulay Hassan I died 7 June 1894 in Marrakech, and is buried in Rabat. ↑ "أولى الصور في تاريخ المغرب، الأولى في الفنيدق/تطوان سنة 1859 والثانية للأمير المولى العباس سنة 1860". Alifpost. 9 June 2013. Retrieved 30 October 2013. 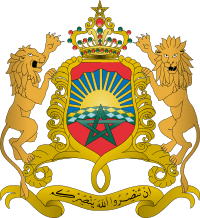 Wikimedia Commons has media related to Hassan I of Morocco.